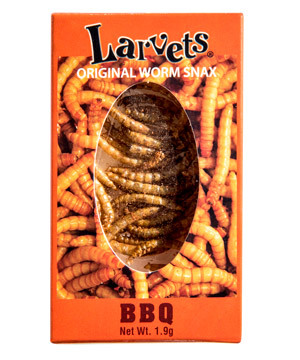 Larvets: Edible insect larva seasoned for snacking. When your parents told you not to eat bugs, they just didn’t know bugs could taste this good. 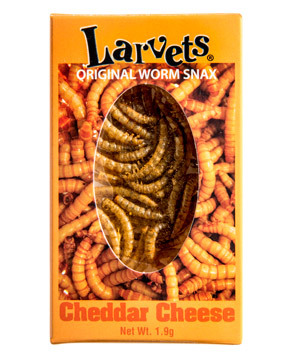 Each box of Larvets contains a heap of whole mealworms that have been dried and seasoned, transforming them into a light, airy snack. Available in three flavors, the crispy critters produce a soft crunch before dissolving in your mouth. 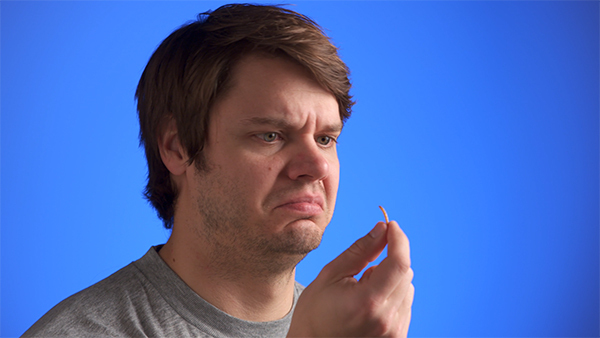 Your brain may know you’re eating bugs, but your tongue will think it’s just munching on a chip. Plus, the larvae provide an alternative source of protein that’s less demanding on the environment. Challenge yourself to try a new kind of snack food that’s healthy, sustainable, and downright tasty. Edible bugs have long been a popular dish around the world, and the trend has even begun to worm its way into US culture. Larvets give you a taste of this adventurous cuisine—with a taste that’s surprisingly palatable! Whether you try them as a way to broaden your culinary horizons or as a gross-out challenge, the snack powder dusted on each insect will give you a pleasurable experience (you know, once you get past the whole “eating bugs” thing). Not just for recess and reality game shows anymore. 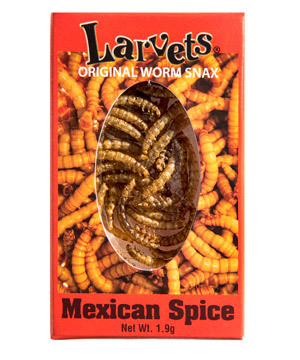 Each pack of Larvets contains a handful of mealworms that are 100% real (and 100% dead, thankfully). The thin exoskeletons munch easily in your mouth, leaving behind the flavor of tasty snack seasoning. It’s up to you to decide if these are disgusting, but we can at least assure you that they’re perfectly safe and perfectly edible. 0% daily fat, 100% daily ewww. 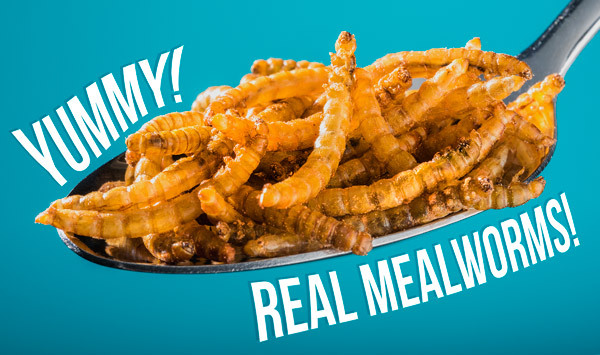 You probably won’t find beetle larvae in convenience store snack aisles anytime soon, but this grub has the flavors you'd expect from those traditional salty snacks. 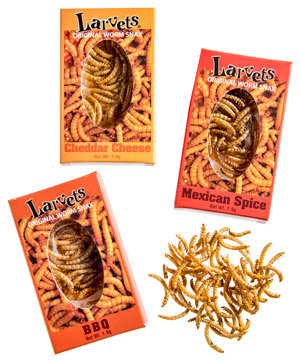 Larvets are available in three flavors: Cheddar Cheese, BBQ, and Mexican Spice. After all, if you’re gonna eat larvae, you want to taste more than just bug. 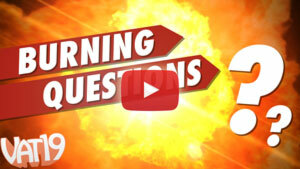 Answer: We understand your confusion. 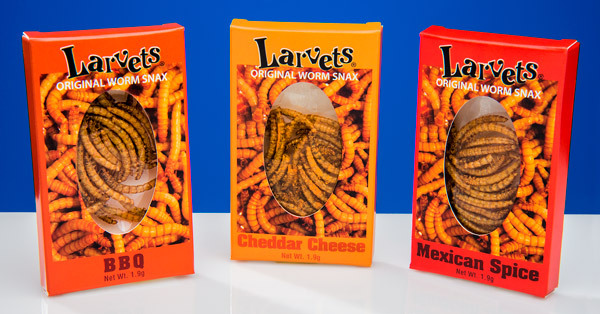 Yes, Larvets are real insects made for consumption. Yes, they are perfectly safe to eat. No, you do not have to be a lizard to enjoy them. Question: What kind of bug is this exactly? Answer: Larvets are the larvae form of the mealworm beetle.